Edward and Diana Cunnington purchased the business from the original owners in 1997. 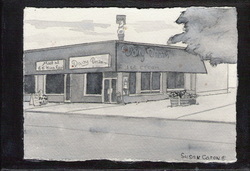 With their son, David, they own and operate Cobourg's oldest family operated Ice Cream Parlour. Dairy Dream is open during the warm months, May through September, serving both soft and hard ice cream, real fruit frozen yogurt and other cold and frozen treats. The photos in our gallery show the variety of products available. Also available are Special Order Ice Cream Cakes; samples of which are shown in our Cake Galleries and can be ordered either in person or by telephone. Please come and enjoy summer with us either indoors in air-conditioned comfort or outside at our tables and chairs.